We’ve been gone from home for two months. We’ve visited Ethiopia, Uganda, South Africa, Mozambique and South Africa again. We’re now in Cape Town, which is on the very bottom of the map. In Kruger National Park, we saw lots of wild animals. As soon as we got there, we saw a rhinoceros and also a huge family of elephants. They have gigantic ears! They also have long, long trunks. And they walk gracefully. Some other animals we saw were cheetahs. They look like polka dotted leopards. (We also saw one leopard in a tree!) Also hippos, mostly in the water. When they come out of the water, they have red tummies. We also saw a big family of buffalo, lots and lots of impalas, and some warthogs, which I really like. And also an animal called a kudu, which looks like a very big deer with very long horns. The male kudo’s horns are squiggly. We also saw a couple of lions, in a tree, but they were hard to see. I think my favorite of all the animals were the elephants, because we went to this place called Elephant Whispers. We met six elephants and we got to know their names. We learned lots of things about elephants, like how long they live (some live to 70 years). And how long it takes them to give birth (almost 2 years!). And how some females can have babies until they are 60. And how their ears are the shape of Africa, which is a continent, not a country! We got to see the elephants lie down and we got to feed them and pet them. We took some pictures of us between their legs. They are very large! 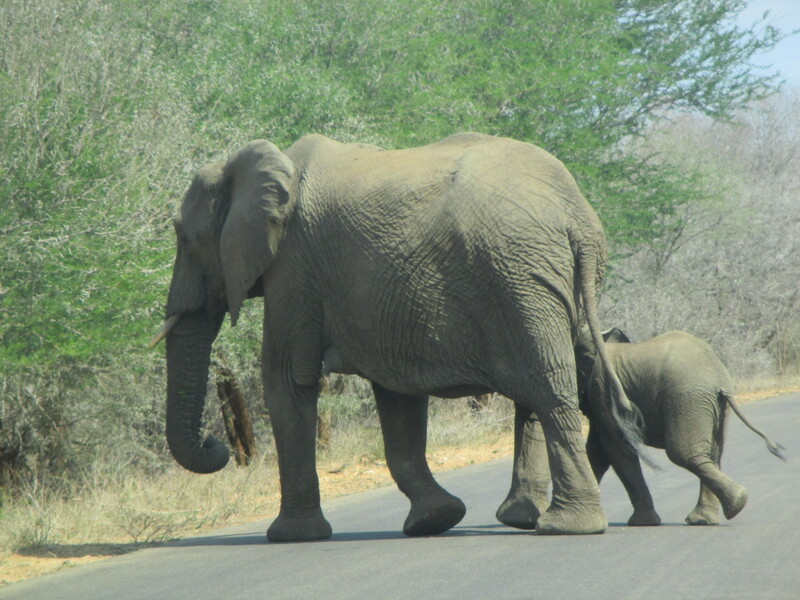 Here is a picture of a big elephant with his baby crossing the road in Kruger Park. I hope you like this post. Please leave a comment. And do shares too! Roman, I really like elephants and they are smart too. The Kruger National Park sounds like it must have been a great place to learn about animals that we don’t see in the United States. I look forward to seeing you this summer and to hear more about your amazing trip…..